Especially after physical activity mallow offers the ideal possibility for regulating the formation of sweat. 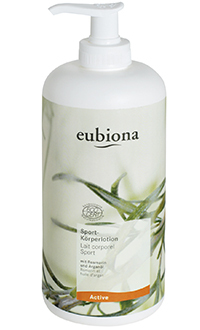 It enlivens the skin and is astringent. The properties of rosemary can help you to avoid skin and nail fungi. You feel refreshed, skin circulation is optimised and muscle tension can be soothed. Apply to still damp skin after showering and spread with circling movements. Aqua, Glycine Soja Oil*, Caprylic/Capric Triglyceride, Glyeryl Stearate, Glyceryl Stearate Citrate, Rosmarinus Officinalis Leaf Extract*, Olea Europaea Fruit Oil*, Argania Spinosa Kernel Oil*, Butyrospermum Parkii Butter*, Mentha Piperita Water*, Myrtus Communis Extract*, Simmondsia Chinensis Seed Oil*, Alcohol, Sorbitol, Sodium PCA, Xanthan Gum, Lecithin Hydrogenated, Tocopherol, Parfum, Citronellol, Limonene, Linalool, Geraniol, Citral. 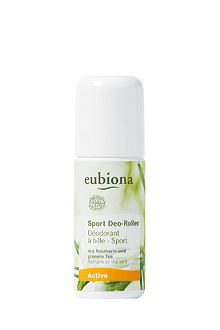 The eubiona Sport roll-on deodorant gives your skin just what it needs for an untroubled day of activity. 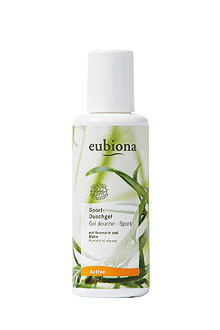 The refreshing rosemary and green tea extracts help you to stay fresh all day long.